In years to come, April 10 will be remembered as a historic day for humankind, science, and women in STEM. 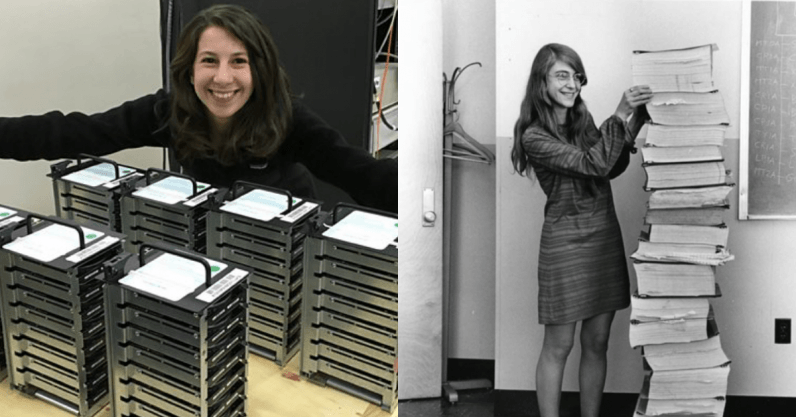 On this day, the first ever image of a celestial phenomenon was published — a black hole — largely thanks to the algorithms created by Katie Bouman. Despite this, the internet is already trying to discredit her revolutionary work. Bouman is a graduate student in computer science and artificial intelligence at the Massachusetts Institute of Technology (MIT), and her research led her research team to create the algorithm. In just two days since Bouman and her team captured the black hole, people online have repeatedly pointed out how she wasn’t the only one on the team or the only author of the research papers so doesn’t deserve the spotlight. Yesterday, the BBC published an article on her work citing her as “the woman behind the first black hole image” but developers have accused her of not writing the code that led to the discovery. Others on Reddit, have even said she’s simply the “photogenic face” of the project. “It makes it sound as if she was the one person responsible that all this came about — but that is not the case. Arguably, there are others who have contributed as much if not more. This is what makes me somewhat feel that this focus on her is not quite fair,” said one user on the thread. The criticism claiming Bouman is just one name of a few on the research paper shows a misunderstanding of how academic papers work. Bouman is the first author of her paper “Computational Imaging for VLBI Image Reconstruction.” The first author on a research paper is typically the person who made the most important contributions. Alongside Bouman, Michael D. Johnson, Daniel Zoran, Vincent L. Fish, Sheperd S. Doeleman, and William T. Freeman worked to produce their findings. “Of course Bouman will not have written all of the code, just like Englert and Higgs are not solely responsible for the discovery of the Higgs boson. Instead of discrediting the contributions of Bouman and the countless other women working on the Event Horizon Telescope, we should take a step back and remember she did not ask for this recognition – people all over the world just got tired of men being the only ones who are praised,” Wade said. In the discussion on Hacker News, and even in our own Facebook comment section, multiple users claim Bouman’s colleague Andrew Chael wrote over 850,000 lines of the 900,000 lines of code used to discover the black hole. Chael tweeted to her defense, saying that without Bouman and her contribution to the software, the project would never have been a success. Scientific discoveries and stories about men in the media are rarely believed to be hyperbole because the default societal perspective is that men make history. Now more awareness has been given to the contributions of overlooked women in STEM, people seem more eager to think Bouman is being celebrated solely because of her gender — when in fact, Bouman’s being celebrated for her revolutionary scientific discovery, alongside her team. Like this article and want to see more like it? We have a monthly feminist tech newsletter called “Lady Bits” — subscribe here.